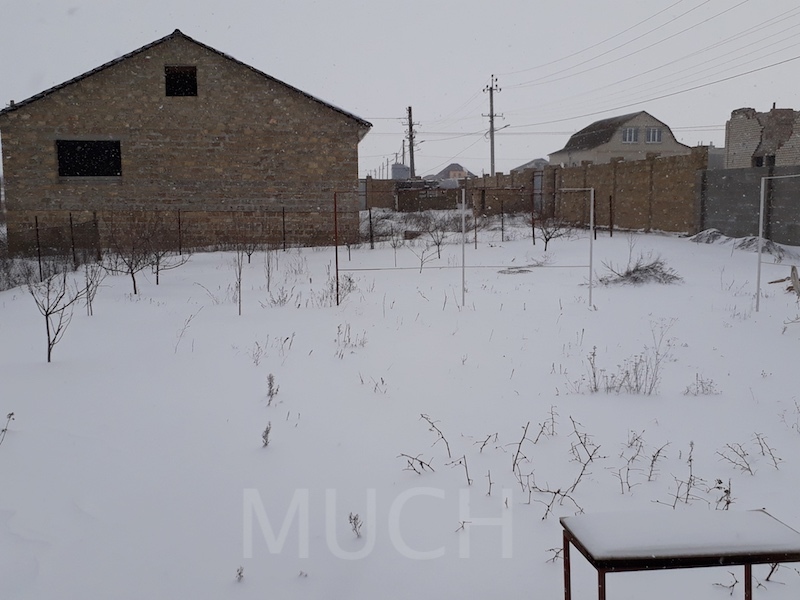 Southern Ukraine received a thin layer of yellow snow. It was tested and determined to be sand and clay particles from Northern Africa. On March 24, we woke up to fresh white snow. We anticipate warm spring weather next week. Step by step, life in Ukraine is improving. New businesses pop up here and there. The tech products, gadgets, and all modern conveniences are available in stores and small shops everywhere. People must have money to buy them. Low overhead is the standard in Ukraine. Language schools are popping up everywhere. English is the most studied language. German, French and Italian, follow. People want to travel. They will save, save, save, to see their dream. Sveta and I traveled to Chernomorsk this month. We met with our massage therapists, children and their parents, our manager, and the students of our transportation scholarship program. See the video of our transportation scholarship students! We see that things are going well. We have many stories to tell. Each visit, we talk with the transportation scholarship students. This time we have a new student (left) who replaced another student no longer needing our help. His name is Vitalik. 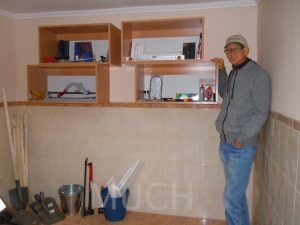 He moved to Chernomorsk from war-torn Donetsk, Ukraine. Here is his story. Vitalik is studying safety information, protection against viruses, for computers. He is in his fourth year of university. 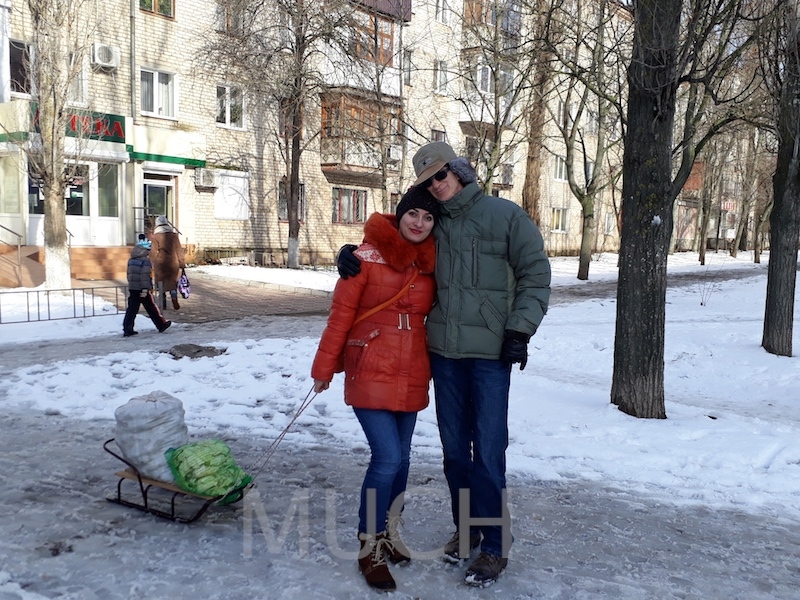 His parents stayed in Donetsk but he moved to Chernomorsk to be able to get a diploma that is not associated with Donetsk universities. Universities and businesses in the rest of Ukraine do not want to work with people who stood behind Donetsk in the war zone. It is assumed that if you live in the Donetsk area, you are part of the problem. Vitalik is not part of the problem, he very pro-Ukrainian. In Chernomorsk he found a good church with wonderful friends. He is involved with a ministry that further strengthens his relationship with God and his friends. All four of our students: Vitalik, Nastya, Daniel and Artur are members of the same church. They serve in one ministry to help teenagers connect with God. They are successful in education and developing a relationship with God. Each of them send words of gratitude to our sponsors. They thank you! Dr. Natalya B, wearing the lab coat, and I moved the massage therapy concept forward in 2004. The oldest patient in the picture is fifteen years old. When she was 3 years old, she was one of our first patients. 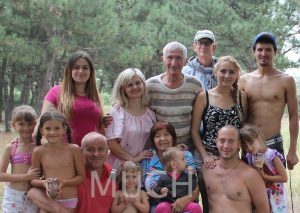 Six parents brought their children to tell Sveta and me their stories. Each child is severely disabled, abandoned by their family doctors. Each parent is very please that MUCH initiated the program and sponsors a portion of their child’s treatment. They see progress for their child and find hope for their family. They thank you! Nine months ago, when Barbara came to this world, the doctors set many negative diagnoses for this girl, one of which was liver cancer. Their verdict did not give any hope for the parents. The doctors predicted that the child would not live. The struggle for Barbara’s life continued. Every day, doctors prescribed a huge list of expensive medicine. They punctured the spinal cord and brain to remove fluid for analysis. Barbara’s mother spent three months with her child in the hospital. When the doctors suspected that one of the kidneys was functioning incorrectly, they wanted to operate. The parents understood this to be only an experiment (exploratory surgery). They decided to visit another doctor and get a second opinion. This doctor, after the examination, said that the child did not have cancer. He canceled all previous diagnoses and the list of expensive medicines. As it turned out, the source of the illness occurred during childbirth. Barbara proceeded through the birth canal for a long time. As she breathed in the amniotic fluid it had a negative effect on the lungs, creating pneumonia. This is a rare situation. It is very important to establish the correct diagnosis and conduct appropriate treatment. The girl was treated. Now Barbara is a healthy child. Only a small problem worried her parents. Her leg muscles were very tight at the hip joints and could not spread her thighs as they should. Ira, our massage therapist, gave her a course of massage. On the seventh day of massage therapy, the hypertonus muscle disappeared, the legs at the hip joints began to spread apart correctly. Barbara’s mother sees this good result. She is very pleased and grateful to the sponsors of MUCH. Also, Mark and I had a great opportunity to tell Barbara’s mother about God. She showed great interest and asked many questions about religion. Thank you all for your support of the MUCH massage program. The children not only receive help and recovery, but also Mark and I can visit families and talk about the Father and Jesus. The parents, and Mark and I and thank you! This entry was posted in 2013 Scholarship Fundraiser, Transportation Scholarship on April 7, 2018 by Mark Koehler. Our winter in south central Ukraine has been a mild one. February is ending with temperatures dipping to 4 degrees F. Our daughter took her son to school on the sled and used it for shopping on the way home. March will come in like a lion. More snow is on the way before it warms up for spring. True Ukrainians like Sveta, are waiting to get out of the house and into the garden! As MUCH has grown in fifteen years our sponsorship unfortunately has not. The exchange rate has kept us on track. In 2002 when I moved to Ukraine, the exchange rate was 5 UAH for $1. This month it has been holding at about 27 UAH for $1. You can see the history of the exchange rate for the last five years on this chart. MUCH support began to grow by word of mouth. Are you sharing with your friends what God is doing through MUCH? We would appreciate if you would! When I began this mission, I was very shy to ask for support. I told my story and people responded. This seemed to be working. Something changed, maybe the economy. For the last two years, we have been under budget with our monthly contributions. In 2017, our monthly support was $500 below budget. By the end of the year, MUCH was $6,000 below budget in contributions. Our year-end report shares all that we are doing. To overcome this deficit, we need additional monthly sponsors. If you are reading this newsletter and are not a sponsor, please consider what $10 a month would do to keep our programs on-fire. This is how I see the work of MUCH. Yes, we are doing God’s work, we are improving the lives and health of children. And that should be enough. I see more. I see that we are taking steps to prevent the domino theory from becoming more than a theory. We are helping to build better community through reaching out to those in need of healthcare, education, and clothing. We are setting an example of strengthening individuals and family. Ukraine is a pivotal country. We are helping it grow toward the EU and the West, away from Russian. In 1992, Russia was part of the Joint Control Commission after the ceasefire agreement of the military conflict between Moldova and the breakaway Transnistrian territory. In 2008, Russian was involved in the Georgian conflict. In 2014, Russia annexed Crimea. Only months later, Russia assisted the pro-Russian separatists in the war in eastern Ukraine, the Donbass region. Many article have been written to strongly suggest that Putin and the Kremlin want their USSR countries back. I see the theory is more than a theory. The longer the time between conflicts, the less real the theory seems. Russian KGB mentality counts on that. I believe that the more MUCH helps the people of Ukraine become more active in changing their immediate needs, the stronger the people, as a country, will become. I’m not political. I am only sharing what I see, and why I believe that you would be interested in strengthening Europe, Ukraine, and its people through the work that we are doing. Children with mental disabilities experience learning difficulties. They cannot concentrate, read poorly, or have difficulty with memory. Here are a few examples of children who are breaking through their difficulties. They are battling their challenges with the technology of computers and computer tablets! Kolya is a calm and obedient thirteen-year-old boy. He loves computer lessons. He has difficulty with remembering things, but in spite of this he learns well. In the beginning of the school year, he could not read sentences, or remember where the keyboard letters were located. Kolya studied the locations of all of the letters on the keyboard, learned to read by syllables, and type text from the textbook onto the computer. Success! Misha studies in the 6th grade and strives to know everything and be able to do everything, but his attention is going in every direction. He always hurries, and in the end does not always succeed. But Luba is very impressed with his success in using the new keyboard program “Mouse Simulator”. Misha learns and remembers the arrangement of letters on the keyboard and simultaneously is learning the letters of the Ukrainian alphabet. He is very happy to study on the computer and often hugs Luba and says, “Thank you, I love you.” Success! Some children, such as thirteen-year-old Nadya, have become better pupils because of their experience in the computer class. In Nadya’s other classes, her learning skills are changing. She is getting better results. Her attention is improving when she studies, her reading skills are better, and Nadya’s vocabulary is growing. Luba believes that Nadya will improve her intellectual abilities. There is a big possibility for her to begin to think and respond to unconventional situations. Luba sees potential for Nadya to achieve her future goals! Success! Vova has a diagnosis of alalia-hypoplasia of speech. He cannot speak sentences, only individual sounds. Vova has learned to play on the computer tablet in logic games and therefore it helps him to improve memory, attention, thinking, and fine motor skills of the hands. Success! Yura, has difficulty with his attention span. He quickly looses interest, tears up his lessons, and is constantly distracted. To focus, he had to make a great effort. After massage treatment and exercises, he has good results. Positive impulses increase, aggressiveness decreases, and his psycho-emotional state of mind improves. Computer training together with massage therapy brought a very good result. Success! Thank you very much Luba, our computer teacher, and our massage therapists Natasha and Paul! Your great patience and love for these special needs children helps them feel accepted and loved. Their work reveals the individual abilities that each child has. For the children in the orphanage, it is very important to have support from people who are nearby. Luba, Natasha and Paul are like loving parents investing in the hearts of the children with love, knowledge, example, rules of behavior and other character building attributes. Step up to the plate and Donate! The children thank you! Ukraine thanks you! MUCH thanks you! 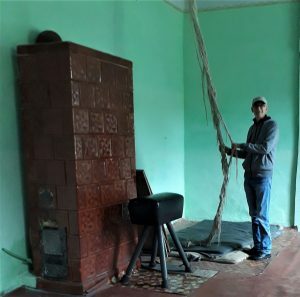 This entry was posted in Changing children's lives, Children in Ukraine, Financial sponsors and tagged God is doing through MUCH on March 7, 2018 by Mark Koehler. Sveta and I will be in America between October 14 and November 28, give or take a day. If any of you would like us to visit with you, we would be happy to do so. We will be in the Greensboro area October 15 through November 7. Please reply to this newsletter, or write to us at [email protected]. 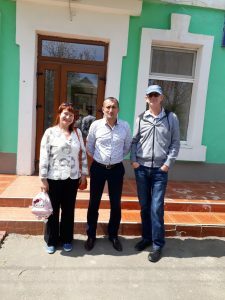 Our journey to Dobromel in western Ukraine began with a ten minute bus to Mykolaiv, and a thirty minute bus to the train station. The next twenty-three hours Sveta and I talked with cabin mates on the train and caught up on much needed sleep. At the Lviv train/bus station we quickly found a bus to Veleeky Lubin where we stayed overnight in the empty infirmary at the orphanage. After visiting with the director and the children, we took a bus to Sambir. From there our final hour of our journey by bus took us to Dobromel. 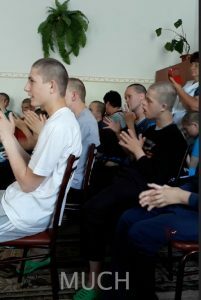 While at the Dobromel Orphanage, we visited our two Ukrainian massage therapists, our Ukrainian computer teacher, the school psychologist, and of course, the children. 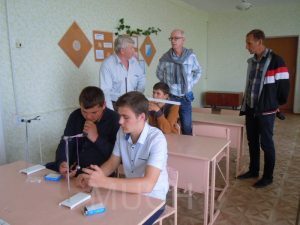 We visited Ternava village school, about three and a half miles south of Dobromel, and Migovo village school, about three and a half miles south west of Dobromel. Five years ago, Natalia began the massage therapy program at the orphanage. This summer she gave birth to a beautiful baby girl. She continues to provide massage therapy, but with a different schedule and for different needs. Now she provides massage therapy for children with emotional or psychological problems for three non-consecutive days a week. Ten-year-old Galina was a very uncontrollable child when I met her three years ago. Her diagnosis is hyperactivity. 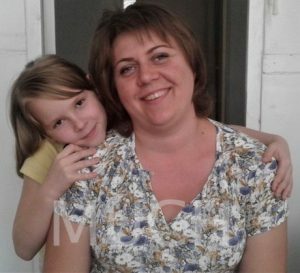 Natalia is beginning a massage therapy program for Galina that will overcome this disorder. Through her need to be with her child, she has broadened the scope of what MUCH is doing at Dobromel! Now Paul is focussing on children with physical disabilities and Natalia is working with children who have emotional and psychologically related disorders. Paul continues to fine-tune his therapeutic skills of massage. He works with children who have muscular imbalance, scoliosis, and other posture problems. After his time fighting for his country, he now turns his attention and talents to the healing arts. Paul’s education has also prepared him as a mechanic, and a trained welder. His additional life experience skills will help him train the children to learn different skill such as plastering, tile work, foundations, and building walls. This month, MUCH provided $185 worth of tools to enable a new class to teach children construction related skills. MUCH will continue to provide tools each year to complete their wish list. I am very excited to see the children develop these new skills. MUCH has been helping the Ternava Village School improve their education program for a few years. They are doing great with what we have provided. They are a community of educators and students who are most eager to take what God has given them and develop it to the max. In this picture, you can see that the elementary children are making good use of the interactive white board. The children enjoy the hands-on learning experience. You can see the Christian cross on the wall. This school was originally developed by a Greek Catholic Priest many years ago. Although it is a government funded school, the spiritual foundation remains strong. My vision for this school is to become a hub that will reach out to of spiritual activities that will reach out to other schools and communities. The music teacher, in red and black, shared with us the singing talents of three of her students. First, they sang a beautiful song as a quartet. The second song was a delightful duet. The director has a vision for her music teacher to provide lessons to play musical instruments, but the school doesn’t have any. The highest priority on their list of musical instruments is a piano. We will address this dream in the October newsletter. In January 2017, MUCH added several new projects. In August, three village’s schools, the orphanage and Transit Home received help. MUCH could not provide the entire list of needs that they shared with us. Each teacher chose from this list several priority items. With the money of our sponsors, the mission purchased five notebooks, a tablet, an interactive whiteboard, sports equipment, a microscope, chemical reagents for chemistry lessons, equipment for physics lessons, construction tools for the construction class, a Swedish wall, and massage aids for $4,429. 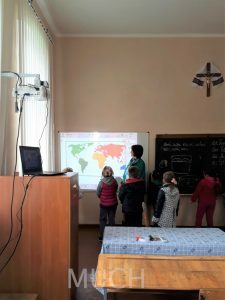 In September we visited a small school in the village of Migovo. They are preparing for winter. Behind the school by the outhouse, the pile up the wood and coal that they will use to heat the school. MUCH bought two notebooks and a tablet for this school. I was impresse d as Maria, the teacher, taught three children a natural science lesson with a high professionalism suitable for as a class of thirty students. When Maria teaches, she shows how she loves her profession and children. She teaches with maternal tenderness and at the same time, a strong focus and deep knowledge of her subject. The students and I listened with great pleasure about the planets of our Solar System. Following her lecture on the new notebooks they were able to see the presentation as she spoke. Maria not only taught, but she involved children to take an active part in this lesson. We are very pleased that the equipment purchased by MUCH helps teachers to teach their lesson and helps children visually and physically learn new concepts. 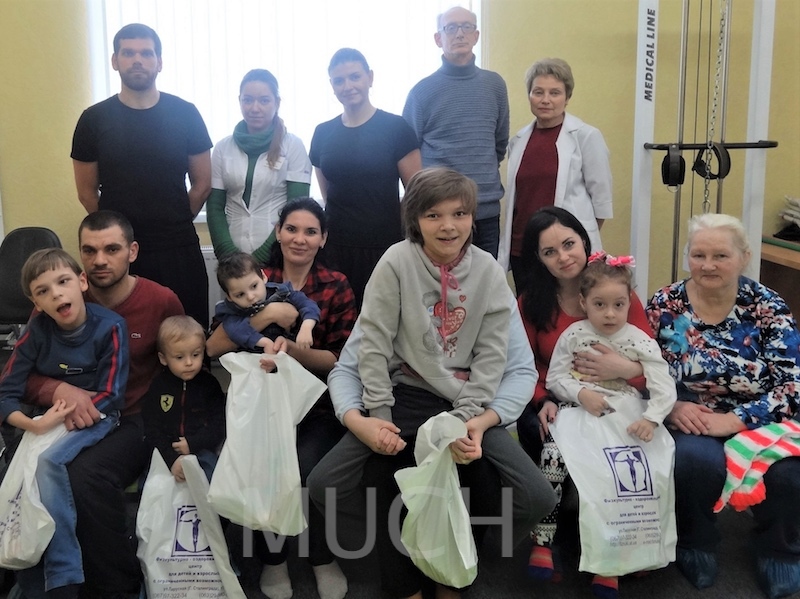 Great thanks to all of you for helping Ukrainian children! The teachers and children are very grateful to you! In the Shostakovo village school these two boys came to us and said thank you very much for your help. I saw that this gratitude was living in their hearts. Because of your interest in our work, prayers, and funding, all of these children are beginning a new school year with new hope! THANK YOU! After a very hot July, the first half of August challenged our patience. Finally, the temperatures cooled and the gentle rains visited us. We had a productive vegetable garden this summer. The fruit trees are producing more each year. Life is good for us in Ukraine. Our son is finished with all connect with the military. He is back to work in his old job. His wife has started an internet based clothing design business. Her business is keeping her busy. Our daughter is doing well with her home based hair care business. Her husband is working in a family remodel business, and has started a rabbit farm. 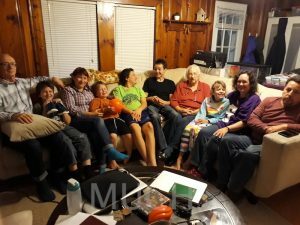 The grandchildren, ages 8, 7, 6 and 3, are showing interest in piano, swimming, dance, and organizational concepts. When I moved to Ukraine in 2002, my general focus was to provide humanitarian aid for children. MUCH moved forward in this direction. As we did, we saw something missing in this lives of the children. That something was knowledge of God. Communicating with the children, we saw a void of love, compassion, and involvement of adults in their lives. Who would tell the children about God? Who knew about God to tell the children. I have learned that in many cases, the children learn about God and draw their parents to church. MUCH has always been a Christian organization. Who we are is not changing. What we do is not changing. Our goals are expanding, growing from sound roots. As we put more focus on education, we will use that connection to draw the children to God. We are taking example from Ukraine Challenge, who have been providing camp experiences for children for many years. We are talking with local translators about camps that focus on sports, English language, games,and maybe life skills. These topics will lead to discussion about God. That is the general goal. Finding enough people to staff the camps is a challenge. We will also be looking to short term missions to come help us. 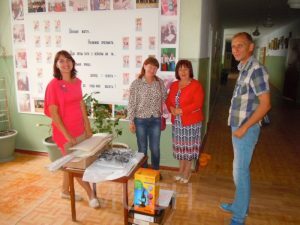 Our church in Mykolaiv is providing camps for local children from schools in our district. They held three camps this summer. They were short on staff at times. 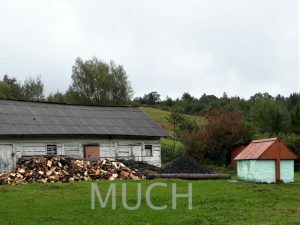 Never-the-less, we want to build a team to help Yura and Dasha in Shostakovo, (July newsletter), provide a camp for the children of the three villages that attend the Shostakovo school. Yura is building church community in these villages as a spiritual leader. 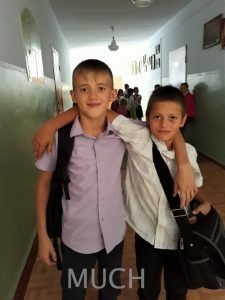 Dasha teaches at the school, so the two of them have the perfect opportunity to follow-up the camps with regular get-togethers with the children. We would like to do this with each village school as God provides the people and the funding. The first step is building a relationship with the children and the school through provision of education equipment. As the school administration come to understand who we are, we can offer to provide a Christian camp experience for the children. If they agree, we need to be prepared to staff a camp. Our end goal is to connect the children to a church or Christian youth organization in their area. The Transition Home in Marganets is a nine month waiting facility for children taken from difficult homes. They will be placed in a foster home, or an orphanage/boarding school. These children are very emotionally troubled. Children in the Transit Home do not have many physical limitations, but they have a huge number of emotional and psychological problems. Their character was formed under adverse conditions. Now, being in Transit Home, each of them is waiting for the decision of their destiny and this is stress for these children. Massage therapy improves the psychological and emotional sphere for these children. Our massage therapist, Yana, has been working at this facility for only seven months. During this time, she gave massage treatment for 35 children. Six of them underwent two courses. 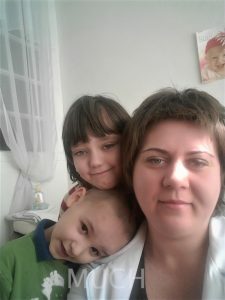 Yana, with her personal character, such as kindness and a gentle individual approach to each child, compassion and a great desire to help these children in their difficult times, helps them to receive a partial healing of their wounded soul. From several of Yana’s reports, I will show the emotional results in a couple of pictures. They show happier, more content children. 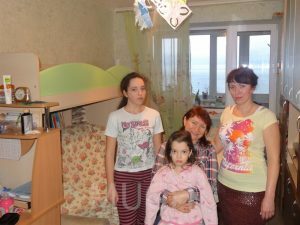 I think that it will help you to see how much help Yana provides for the children. 1. Natasha was afraid to be touched. She gradually got used to Yana’s gentle touch. After each massage treatment she became more calm and balanced and her emotional state improved. 2. Igor had frequent colds and was sometimes whiny. After the massage treatment, his mood and his general condition improved. 3. All massage treatments for Vanya were accompanied by communication. At first, he was sharp, rude, and made many claims to others. After several days of massage treatment Vanya became more gentle and his emotional state improved. 4. Marina was a restless, irritable girl, at first she did not want to take off her clothes before the massage treatment. By the third procedure she began to undress herself. By the fourth treatment the girl began to perform all the physical exercises that must be performed after the massage treatment. Marina stopped becoming irritable and nervous. 5. Dima gladly accepted all the procedures, happy for the attention. At first he only smiled and nodded his head at all of Yana’s questions. By the fifth procedure Yana heard him speak his first words. 6. Nina is very kind; she answers questions with pleasure. She likes to sing songs during the massage therapy. Her posture needed attention. The massage treatments provided better posture for Nina. At the end of each procedure, Yana and Nina always hug each other. 7. Valya answered Yana’s questions inaudibly, she was a very touchy child and demanded increasing attention. After several days of massage treatment, Valya began to trust Yana and she changed a lot. 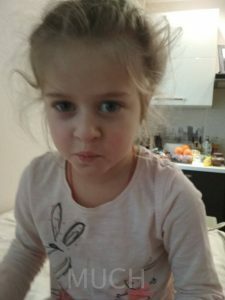 To remove psychological stress, to calm the child and develop a positive attitude to his or her body and to him or herself as a person, massage therapist Yana selects relaxing techniques of classical massage and individual methods of communication with the child. Thanks to this, the child experiences a feeling of emotional connection with Yana and trusts her. This allows the child to acquire a state of psychological security and improves the child’s development process. Thank you for making it possible to bring Yana on to our team. Thank you for caring our children here in Ukraine. It is a big job, and it is growing each year. This year we will touch the live of more than 700 children through massage therapy, education, and clothing. The children thank you! 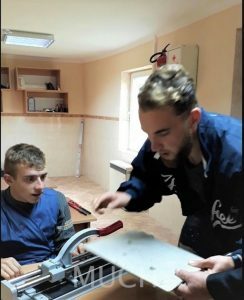 This entry was posted in Children in Ukraine, Special needs children on September 6, 2017 by Sveta Koehler.